More than two years after being arbitrarily dismissed, almost 130,000 Turkish public sector workers are still awaiting justice and facing an uncertain future, Amnesty International said in a report published today. Purged beyond return? No remedy for Turkey’s dismissed public sector workers reveals that doctors, police officers, teachers, academics and tens of thousands of other public sector workers dismissed from their jobs for alleged “links to terror groups” are yet to be reinstated or compensated, while the Commission set up to review dismissal decisions is woefully unfit for purpose. “Branded as ‘terrorists’ and stripped of their livelihoods, tens of thousands of people who have had their professional and family lives shattered are still awaiting justice,” said Andrew Gardner, Amnesty International’s Turkey Strategy and Research Manager. 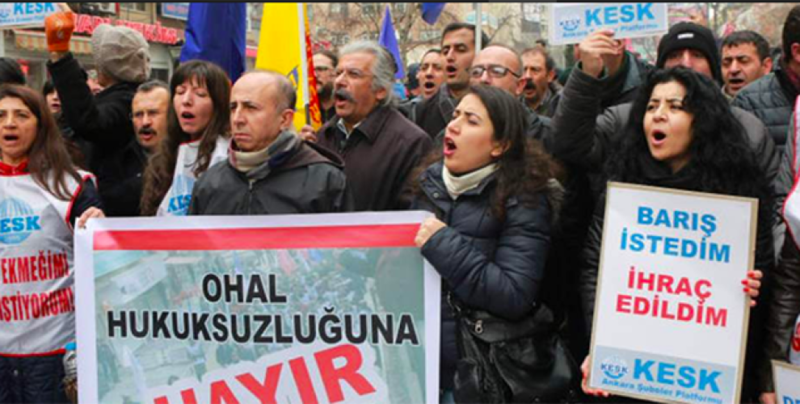 Under the state of emergency that followed Turkey’s 2016 coup attempt, almost 130,000 public sector workers were arbitrarily dismissed through executive decrees. Innocuous – and at the time entirely lawful activities - have been used by the Commission to retroactively justify the dismissals and decisions to permanently bar these people from working in the public sector or even in their professions. Actions such as depositing money in a certain bank, membership of certain trade unions or downloading a particular smartphone app were used as evidence of “links” with proscribed “terrorist” groups, without any further proof of such links or evidence of wrongdoing. In January 2017, after mounting political pressure, the government in Turkey set up a “State of Emergency Inquiry Commission” (the Commission) to review dismissal decisions taken by executive decrees. Out of approximately 125,000 applications made by dismissed individuals, the Commission issued decisions in only 36,000 cases as of 5 October 2018. Of these, original decisions have been overturned in less than 7 per cent (2,300) of cases. The report, which involved a review of the Commission’s procedures and 109 of its decisions, as well as interviews with 21 dismissed individuals and their families, reveals that the Commission is not set up to provide an effective remedy. It is deeply flawed by a lack of institutional independence, long waiting periods, absence of safeguards allowing individuals to effectively rebut allegations, and weak evidence cited in decisions upholding dismissals. Amongst the decisions Amnesty International reviewed, applicants had to wait for the Commission to decide – in the best case – for more than seven months following their dismissal, and 21 months in the worst. However, vast majority of applicants are still awaiting a response, many for more than two years. People making applications to the Commission face a Kafkaesque ordeal. When they were dismissed, public sector workers were not given reasons for their dismissal beyond a generalized justification that they were assessed to have “links to terrorist organizations”. Without knowing specific allegations they were facing, or evidence that was used against them, people submitting appeals had to speculate about the reasons for termination of their contracts, making it difficult to rebut such allegations and mount effective appeals. Some Commission decisions also lacked sufficient information on the evidence that lead it to conclude that an individual applicant had links to proscribed groups, once again making it extremely difficult for public sector workers whose appeals had been refused to mount a subsequent appeal at the administrative courts. Those public sector workers who are lucky enough to be reinstated are often left in a position that is materially worse than the one they had been in prior to their wrongful dismissals. Despite the clear breaches of international law, the government is persisting with its deeply damaging strategy. While Turkey’s state of emergency has come to an end, a new law was passed in July 2018 to allow summary dismissals of public sector workers deemed to have links to “terrorist” organizations - or other groups posing a threat to national security - to continue for another three years. “More than two years since the first dismissals began, tens of thousands of public sector workers are living in limbo without effective remedy. Rather than providing a mechanism for justice, the Commission has merely rubbed salt into their wounds,” said Andrew Gardner. Turkey is party to International Labour Organization Convention 158, which protects against arbitrary dismissals without due process. Among the protections contained within the Convention are those that prohibit employees’ employment being terminated for reasons other than legitimate ones related to the worker’s capacity and their conduct in their role, and require that individuals’ employment is not terminated without their first having the opportunity to defend themselves against the allegations made against them. The procedures surrounding such dismissals, and in particular a lack of a fair and effective appeal procedure, threaten the rights to fair trial in civil proceedings guaranteed under Article 6(1) of the European Convention on Human Rights and in Articles 14 and 15 of the ICCPR. Turkey's failure to provide an effective means by which those whose rights are violated can obtain a remedy for these violations is also a violation of its obligation to ensure the right to a remedy under Article 2(3) of the ICCPR and Article 13 of the ECHR.